A 1901 4 cent Pan-American invert error stamp will be presented at the auction. This commemorative edition stamp is going to be sold for $10,000 on the Cherrystone Auctions on Jan,10. The starting bid is $9,500. This type of inverts was made to demonstrate the American technological progress and its fruits back in 1901 of the Pan-American exposition in Buffalo. These inverts are considered to be one of the most valuable stamps for American errors collectors. The first reason for it being so valuable is their looks of course. They are pretty detailed and aesthetic. The second reason is rarity. This example is presented with wide margins. There are almost 100 pieces of such stamps with errors, 97 are known. The whole issue was destroyed, when the error was noticed except for those 100. The auction house commented that the only pane that was left with those 100 stamps was stuck to the archive pages, so they are without gum or with a deficient one. The gum on this example is present, but it is not initial. The other piece from this pane was sold last year, it was of mint color, 2 cent 1901 Pan-American invert. It was sold for $29,500. The stamps 1 cent and 2 cent shouldn’t have even been printed, it happened by accident. The 4 cents were meant to be printed, due to the misunderstanding. 2 cents are quite rare, only 80 of them are known. 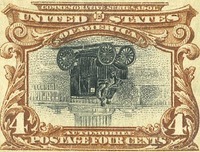 The auction will provide the 1 cent stamp as well, the starting bid is $4,750. ′CIA invert′ will also be available to obtain, as it is one more popular U.S. stamp error. In total, only 95 examples of 1979 error exist up to these days and one of them will be sold. The stamp has a story behind this name. The CIA agent bought the only sheet with error at the post office. Nowadays ‘CIA invert’ starting bid is $14,500.